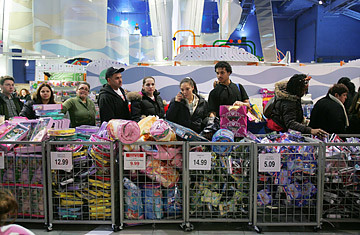 Here's hoping you avoided the food coma: you'll need your wits about you for Black Friday. The traditional day-after-Thanksgiving shopping bonanza has become a full-contact sport, with crazed shoppers determined to find the best deals, sometimes with tragic results. In last year's frenzy, a worker at a New York Walmart was trampled to death when the store opened its doors; two shoppers were shot in a dispute at a Toys "R" Us in California. The ensuing safety concerns may have prompted some shoppers to think twice, but retailers still expect a bonanza: the weekend after Thanksgiving is expected to account for some $40 billion in sales. As early as the 19th century, shoppers have viewed Thanksgiving as the traditional start to the holiday shopping season, an occasion marked by celebrations and sales. Department stores in particular locked onto this marketing notion, hosting parades to launch the start of the first wave of Christmas advertisements, chief among them, the Macy's Thanksgiving Day Parade, running in New York City since 1924. The holiday spree became so important to retailers that during the Great Depression, they appealed to President Franklin D. Roosevelt in 1939 to move Thanksgiving up in order to stretch out the holiday shopping season. Roosevelt obliged, moving Thanksgiving one week earlier, but didn't announce the change until October. As a result, Americans had two Thanksgivings that year  Roosevelt's, derisively dubbed "Franksgiving," and the original. Because the switchover was handled so poorly, few observed it, and the change resulted in little economic boost. The term Black Friday itself was originally used to describe something else entirely  the Sept. 24, 1864, stock-market panic set off by plunging gold prices. Newspapers in Philadelphia reappropriated the phrase in the late 1960s, using it to describe the rush of crowds at stores. The justification came later, tied to accounting balance sheets where black ink would represent a profit. Many see Black Friday as the day retailers go into the black or show a profit for the first time in a given year. The term stuck and spread, and by the 1990s Black Friday became an unofficial retail holiday nationwide. Since 2002, Black Friday has been the season's biggest shopping day each year except 2004, according to market-research firm ShopperTrak. Nevertheless, retailers continue to tie one-day in-store sales to Black Friday. In the Internet era, bloggers race to obtain leaked circulars and post them online weeks in advance of Thanksgiving. Many forums and websites chart the deals, helping shoppers make a plan of attack for the big day. And attack they will  the National Retail Federation anticipates 134 million people will hit the stores on Thanksgiving weekend. After the deaths last year, there's an added focus on making sure stores are ready to handle the crowds. Walmart extended hours to keep stores open on Thanksgiving Day to try and handle the crush and had safety experts develop plans for all their stores, a tactic followed by many retailers. See a brief history of the Macy's Thanksgiving Day Parade.